Though I had bought Super Mario 3D World for the Nintendo WiiU almost a year ago (think it was in November), I hadn’t gotten around to playing it until a little bit ago. But since I started, I’ve probably been playing it a bit too much or just need more to do. It’s much fun. 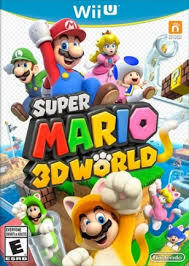 Once again the awesome folks at Nintendo (one of my all-time favorite companies) made yet another fun Mario game that while brings much newness to the franchise still retains the nostalgia of playing so many Mario games growing up. I’m not sure how they manage that balance, but they do. Hats off to you Nintendo. Though I really haven’t played it much on multiplayer, it’s so awesome that the different characters play differently like waaaayyy back in Super Mario 2. Luigi jumps higher, Peach floats, Toad is fast, etc. So awesome to see that again. The levels and challenge are pretty well balanced too. I find myself devoting way too much time and effort in collecting green stars and stamps, but I just can’t help it. It’s rewarding when you get a really tough one! This is an awesome game, that’s much fun. Brings back some great childhood memories, yet is still new at the same time.